Perth Harmony’s Barbershop Taster programme wrapped last week, with 22 singers graduating after six weeks on the risers. The programme finished with the newly-minted barbershoppers getting their first taste of performing in front of their proud friends and families. The chorus threw open its doors to newcomers in July. Any woman who loved singing and wanted to get a taste of the barbershop art form, and learn to sing four-part a cappella harmony, was encouraged to come along. No musical experience was required – just a willingness to learn! Carole Macintryre, Perth Harmony’s Master Director, said she looked forward to welcoming back many participants to complete the audition process. Programme participants said that they loved the feeling of being part of the chorus and had made friends on the risers quickly. 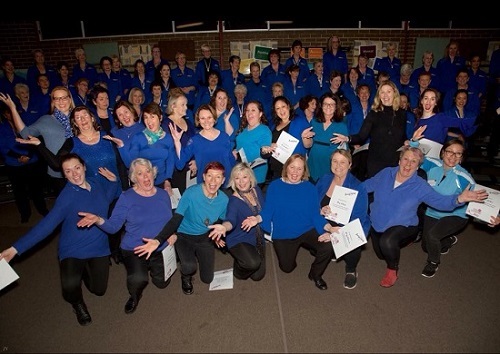 Perth Harmony partners with Mentally Healthy WA’s Act-Belong-Commit campaign, and believes that being a chorus member promotes good mental health, helping to decrease stress, depression and anxiety.